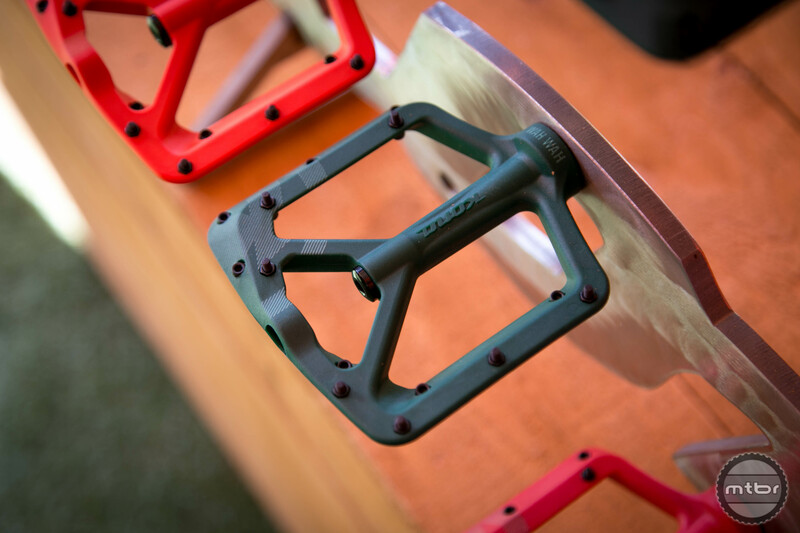 The new Crankbrothers Mallet DH pedal was designed with input from Greg Minnaar and Steve Peat. At least year’s downhill World Championships, 11 of the top 12 podium finishers were riding Mallet DH pedals. To say it’s one of the most popular pedals on the World Cup circuit would be an understatement. For this model year, the platform has been completely redesigned. It now sports chamfered edges to help reduce rock strikes and a number of modifications to increase traction. For more info, check out our coverage here. This is a pre-production model of the new dual-option Ambix which is set to launch later this year. In response to frequent requests for a dual-sided option, Xpedo is set to launch the Ambix, which has a SPD clip on one side and aggressive flat pedal pins on the other. It’s designed specifically for rough trail riding, and is more robust than the more commuter-centric options already on the market. Bearings are sealed and it will be availed in three anodized colors when it launches later this summer. Price is $89. 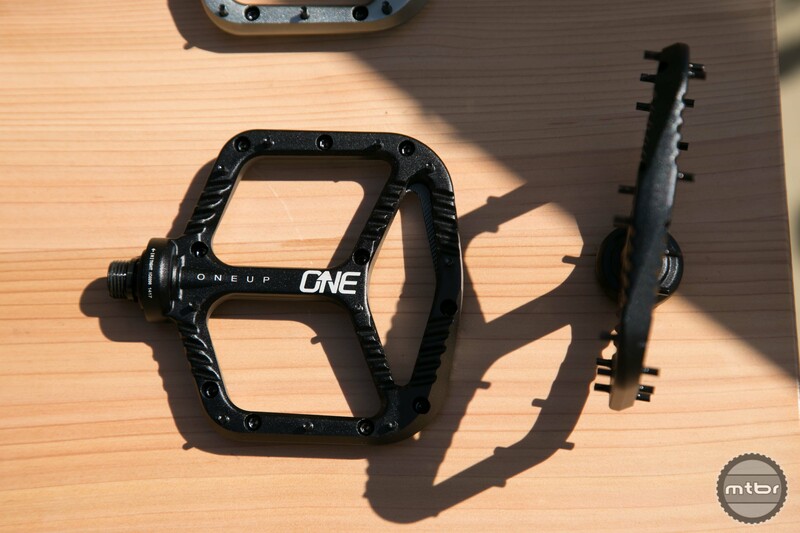 The OneUp pedal spins on four cartridge bearings. 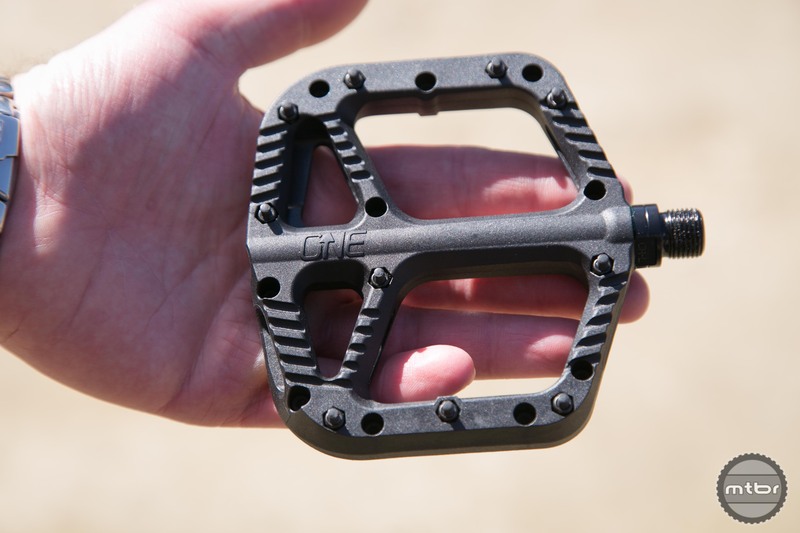 OneUp may have won Sea Otter with their new EDC tool, but their forthcoming flat pedals also look exciting. The feature that captured the most attention was the use of a cassette tool to simplify axle removal. The pedal body measures 115x105mm and is 12mm deep. There are 10 pins per side and claimed weight is 350g. Price is $125. While the alloy versions ships in a myriad of colors, the composite version will only be available in black. Is the alloy version too rich for your blood? OneUp is offering a nearly identical version in plastic. It’s a little thicker than the alloy version but shares the same platform shape, bearing configuration, pin placement, and overall weight. Retail will be $48. Both pedals should be available this May. We can’t wait to get our hands on a set. This new Wah Wah platform is gigantic. This photo does not do it justice. The Kona Wah Wah is one of the best flat pedals ever made. It’s thin, light, relatively cheap, and burly. This year, it’s been supersized. The platform is roughly 20% larger, which should appeal to anyone with clown size feet. 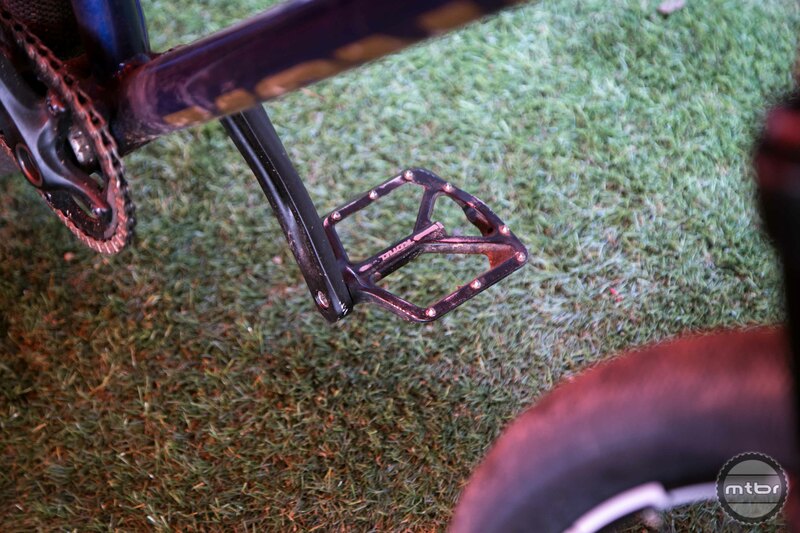 While hanging out in the Kona booth, we also spied a prototype pedal on an athlete’s bike. It appears to be the alloy version. Stay tuned for more info. The Black Kat replaced the Decoy as Deity’s entry level alloy pedal. The new Black Kat replaced the Deity Decoy in the lineup. If you’re a long-time fan of flats, you’ll recall the Decoy filled the same space as the Kona Wah Wah. It was thin, cheap, and bombproof. Earlier this year, Deity completely overhauled their product line. As part of that initiative, the Black Kat was born. It’s thinner, larger, and lighter than its predecessor. It’s available now in a half dozen colors and retails for $114. 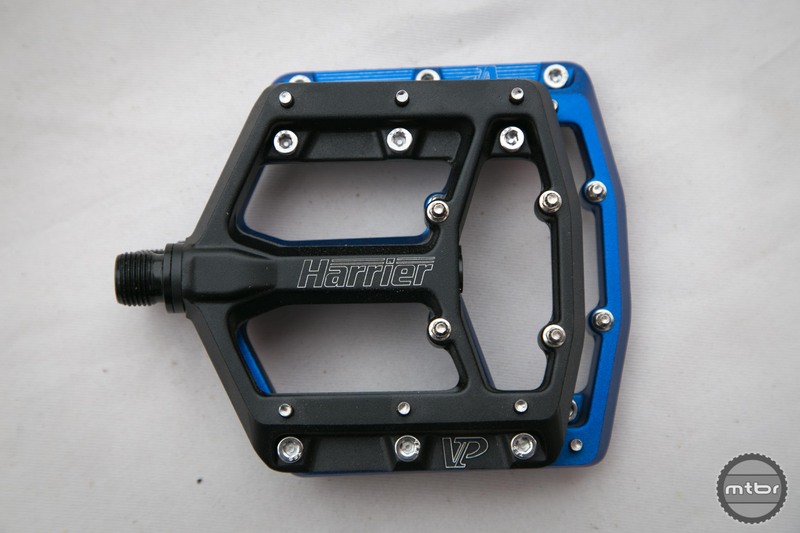 Size comparison between the Harrier C and Harrier pedals from VP. The Harrier is VPs premier flat. At 120x100mm, it’s also gigantic. 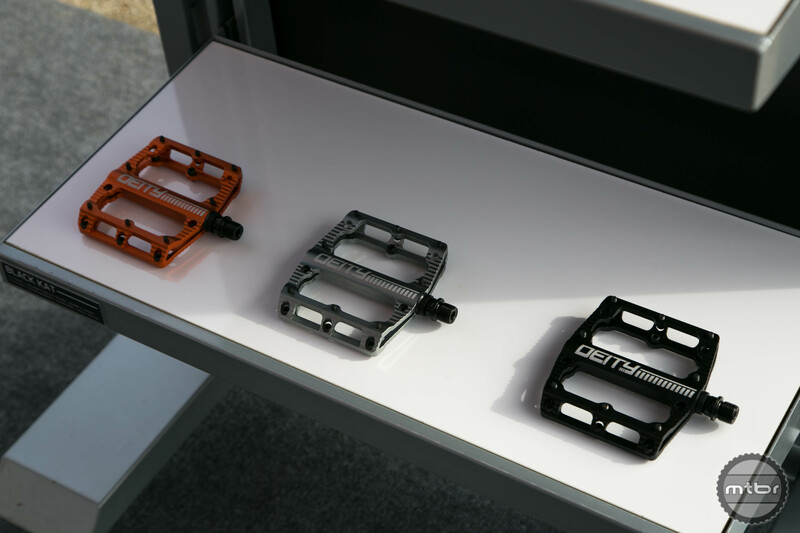 For riders looking for a smaller platform, they’re launching the Harrier C. The pedal shares the same general layout, shape, and axle configuration as its larger sibling, but the platform is only 100x100mm. Weight is 362g, which is a smidge lighter. 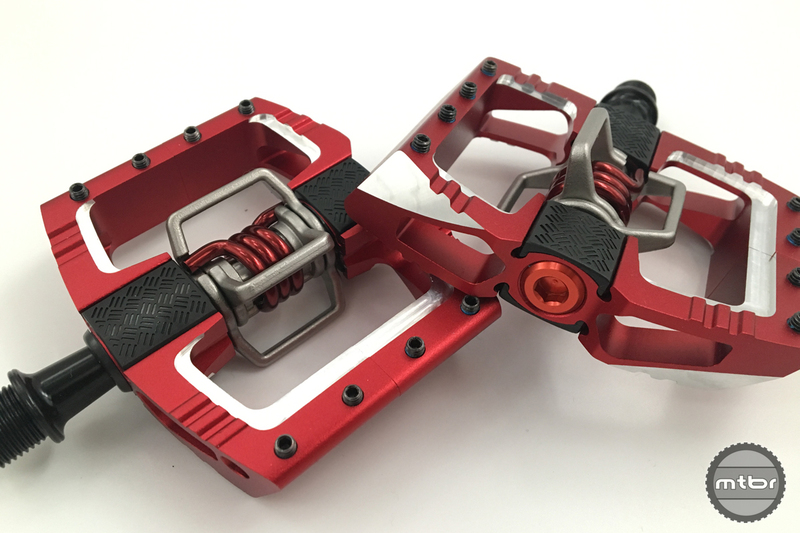 The pedals will be available in black, green, blue, and red. Price is $120. VP claims their new budget pedals offer the same level of functionality as more expensive offerings from Shimano. The product VP was most excited about was the new VX-E clipless pedal. With a retail price of $50, it’s targeted towards the entry-level segment of the market. What sets it apart is the functionality. 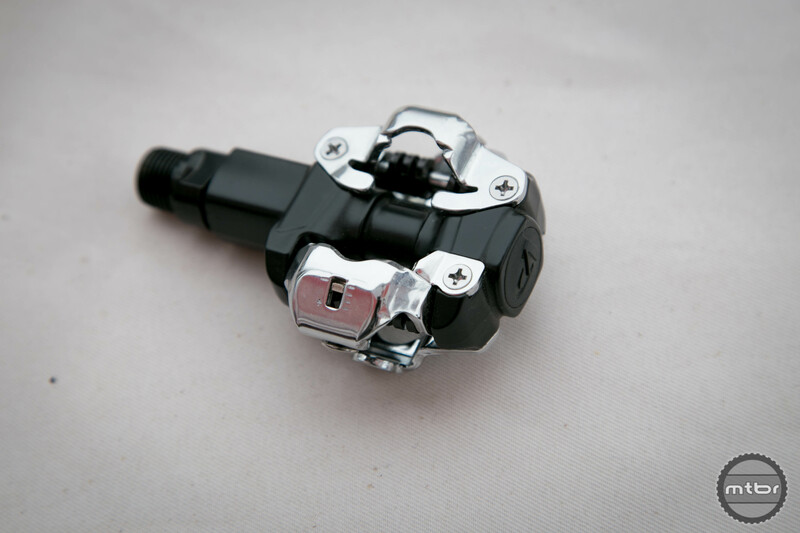 While many brands claim that their pedals are compatible with Shimano cleats, the performance isn’t the same. After two years of development, VP believes they’ve cracked the code. We bought a set home for testing, so we’ll let you know after we get in a few rides. 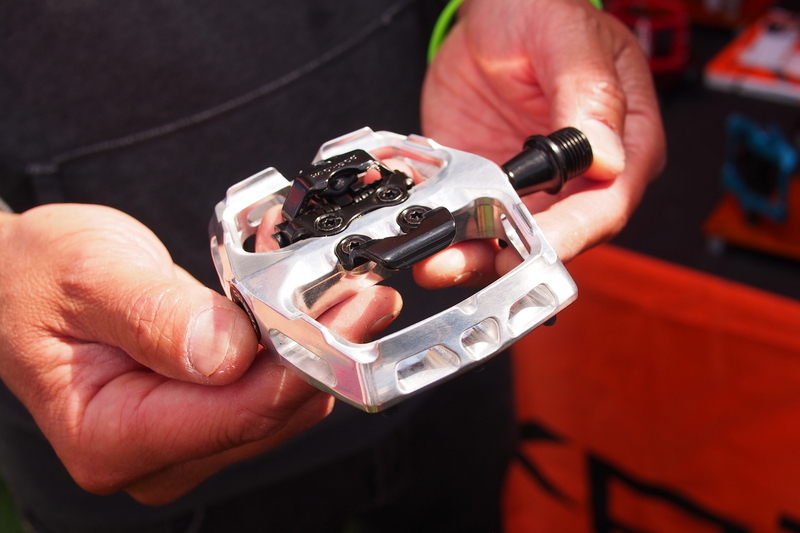 The new Mallet DH pedal was designed with input from Greg Minnaar and Steve Peat. @ Josh: It looks like the pins on the alloy One-Ups are the bitey-er set-screw style. I’m really more of a clipless guy myself, but I also definitely notice that I get a lot more traction from the set-screws in my Crank Brothers pedals compared to my Xpedo Spry pedals.